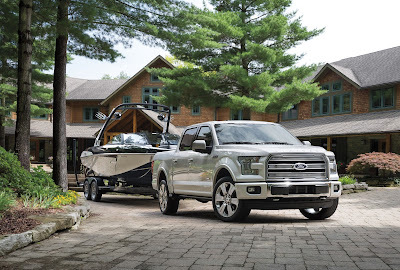 BRIGHTON, Mich. - Last week, we blogged about how the all-new Ford F-150 is the most fuel efficient truck every created, and now we're here to tell you that the 2015 F-150 Limited is the most advanced and luxurious truck ever! Ford Motor Company is the nation's leader when it comes to trucks and it has just introduced the most luxurious truck ever, the Ford F-150-Limited. The 2016 model will hit dealerships this winter, and will come loaded with more standard technology and driver convenience features than any other light-duty pickup truck. Coming standard on the F-150 Limited is SYNC 3 with AppLink and class exclusive features such as 360-degree camera system adaptive cruise control, quad-beam LED headlamps, remote tailgate release and multi-contour massaging front seats. Wait, did we just say MASSAGING FRONT SEATS? Oh yeah we did! 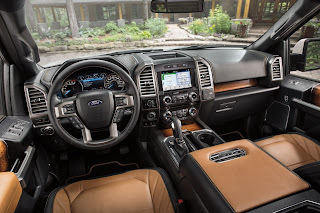 The F-150 Limited is the most advanced and luxurious truck ever, and the updates are not just limited to the interior, but the exterior of the truck as well. Design elements include raised "LIMITED" lettering on the hood, a unique custom satin chrome grille and tailgate, 22-inch wheels, genuine fiddleback eucalyptus, Mojave leather seating surfaces, a unique instrument cluster face and a laser-engraved VIN plate with production number. The F-150 Limited also comes standard with a Sony 10-speaker sound system with HD-Radio, a subwoofer and single CD-player, paired with a 5-year subscription to SiriusXM Traffic and TravelLink systems. And, of course, we cannot talk about a new truck from Ford without also mentioning that it comes with the innovative Ford Pro-Trailer Backup Assist that is available for the F-150 Limited as well! Ford has not released pricing information for the F-150 Limited quite yet, but you can bet that Brighton Ford will keep you updated on all the new information regarding this beautiful new truck! If you have been thinking about trying out America's favorite pickup truck, the Ford F-Series, then stop by Brighton Ford today to take one out for a test-drive! At your Brighton Area Ford Dealership we have the F-150, F-250 AND the F-350 currently available to see at the lot! You can also schedule a service appointment online or browse our new and used inventory! Currently, we are offering up to $17,200 OFF the MSRP price of the 2015 F-150, which you can lease right now for just $138/a month*! Brighton Ford is located at 8240 Grand River Ave. just north of I-96 in Brighton. We are a family owned and operated business that strives for customer satisfaction. For more information on Brighton Ford visit BrightonFord.com or give us a call at (800) 836-8206.